Pointe Michel, the southern village where 33 people perished during Hurricane Maria on September 18, 2019, now has something physical to remember that sad event. On March 7, 2019 a plaque bearing the names of the victims from that community was erected near the St. Luke's school. On the plaque were the words: "In remembrance of those who passed and still missing after the devastation caused by Hurricane Maria on September 18, 2017. Let this be a symbol of our respect for the families of the victims and a constant reminder that they are gone but not forgotten." It was donated by the La Salette Global Association (LAGA) based in London, England and chaired by Carlton Philbert. Pointe Michel was among the hardest communities hit by the deadly storm with over 15 persons either feared dead and or missing. A review of Hurricane Maria published in The Sun one year after the storm stated: According to information from the police, four were confirmed dead in Pointe Michel and 13 were missing. They also confirmed that on October 23, 2017 two skulls and skeletal remains were discovered in Pointe Michel at the home where Darry Grove, Nashon Attidore, Randolph Charles and Phillipson Renault were reported to have been residing during the storm. They also reported that on October 30, 2017 in Pointe Michel, skeletal remains believed to be that of Edith Fontaine was recovered. Confirmed dead in Pointe Michel were Royston Toussaint, Murray Delmore, Veronica Peltier and Glen Alexander. Chairman of LAGA Carlton Philbert and Parliamentary representative for the area, Denise Charles, delivered remarks at the function. 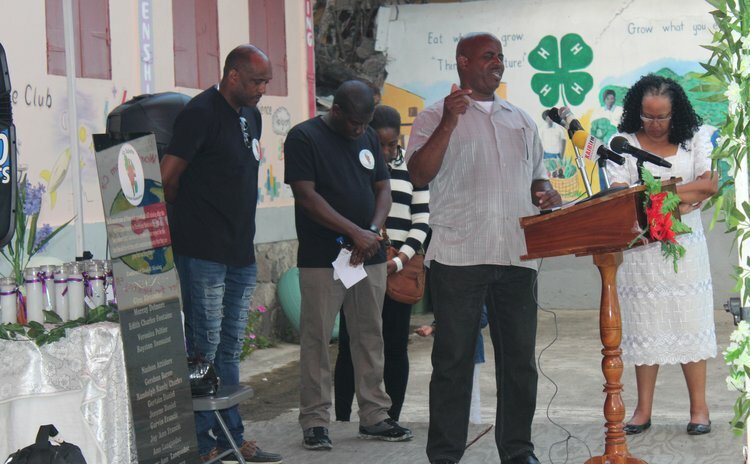 Philbert gave the commitment that his group will "continue to do its utmost best for Pointe Michel and their next project is targeted towards the youth." Charles said that such an initiative by LAGA "shows the growth of our community as a people that together we can work together, be there for those who are in need and give support to other families when they are suffering… that is what I saw from Pointe Michel after Hurricane Maria." Jerome Bardouille, a school teacher and community-based activist said: "This plaque speaks volumes to us telling us about their contributions to us and the community. Their life must propel us to excelling, to push us more as those we have lost really impacted us and the sacrifices that they have made." "If it had not been for God on our side, we would not have been where we are today. It is also good when a community can come together and show that we care…let's continue to work in this vain and if we could only reach out a little more than we have done and show what true love is, there is nothing that can beat love. This is a sign of a community which means that we can come together and work together despite our political affiliation and religious preferences that seem to divide us ought not to have power over us," Bardouille, who blessed the plaque, said. He continued: "I want to commend every one of you, what you have done speaks volume. It says that you care and you are concerned about your community. This is a wonderful initiative from Global association. Whenever anything good happen here, we rejoice; so we rejoice with those who rejoice; but we mourn and grieve with those who grieve." Also present was Dominica's Lady of Song Ophelia Marie who performed the functions of Master of Ceremony and Parish Priest Fr. Peter.